In the previous post, I analyzed the meaning of Daniel 9:27. There is theological support for two ideas. First, there is support for the idea that the 7 year covenant the Antichrist confirms with Israel is a security covenant in some way, designed to provide protection. We cannot be dogmatic about this claim, but it certainly has support. Secondly, there is support that the Antichrist doesn't necessarily create a brand new covenant, but confirms or causes an existing one to prevail. In this post, I would like to analyze some of the ominous developments within the European Union. As I said in the previous post, the EU's 7 year framework with its neighbors, the European Neighborhood Policy is up for review. These translations/interpretations of Daniel 9:27 are quite interesting, especially in light of the fact that the EU has a recurring 7 year foreign policy framework with many countries. Israel is one of the several countries in the European Neighborhood Policy. This policy rewards countries with financial benefits in exchange for meeting the reforms and goals outlined in the country's action plan. It is funded on seven year framework.The first program like this was called the European Neighborhood and Partnership Instrument, effective January 1, 2007 - December 31, 2013. The second program, the European Neighborhood Instrument, is effective January 1, 2014- December 31, 2020. European leaders have admitted that this program is not having the desired effect, since the EU's "neighborhood" is a "ring of fire" with all the crises and political catastrophes. The ENP is not having the desired effect of bribing them into respect for democracy, human rights, and rule of law. Therefore, the ENP is up for review by the end of 2015. Efforts in the past to enhance or strenghen the program have not been terribly effective. Hence the ENP Commissioner has been charged with presenting a comprehensive review of the program. On his Twitter page and in his confirmation hearing, the new ENP commissioner, Johannes Hahn, emphasizes that the European Neighborhood Policy is important for European security. Admittedly, this could be a vague pronouncement typical of European leaders. After all, there is a paper as far back as 2005 that talks about the "The Security Dimension of the European Neighborhood Policy." However, could it possibly mean something more this time around? Before addressing those questions, I will switch gears to another topic that could shed some light on the matter. Due to new arrangements prior to her appointment, the High Representative oversees the ENP Commissioner, among others. In her own confirmation hearing, she had something very interesting to say about the European Neighborhood. The Council furthermore reiterates the urgent need of enabling the EU and its Member States to assume increased responsibilities to act as a security provider, at the international level and in particular in the neighbourhood, thereby also enhancing their own security and their global strategic role by responding to these challenges together. The Council reaffirms its commitment to strengthen CSDP, in line with the Conclusions from the European Council of December 2013 and its own Conclusions of November 2013. What do these quotes mean? Again we shouldn't let the bureaucratic eurospeak get the best of us. Recall what she said in her hearing and what the Council said in the November Foreign Affairs Council. These phrases make it sound like she wants to project force in the neighborhood and on the international scene. According to her, the EU's actions are, in some sense, borderless. Presumably, the EU wants to act in the same way to outside crises as it would internal crises. This language is interesting, because the EU already does civilian and military missions in neighboring missions. (Granted, most of the military missions are training missions, but I digress). However, the content of her speech make it sound like she wants to bring this external intervention to a whole new level. The EU is like a slowly boiling frog. Just a little hotter...just a little hotter....and the frog doesn't realize it's boiling to death. Same with the EU. This is a gradual logical step after all they've said so far. But rather shocking and audacious words in comparison to 15 years ago. Indeed, a benign European trade community now has unelected leaders with aspirations to become a global military superpower. But ironically, it sometimes struggles to hold itself together (see: Eurozone crisis). Both weak and strong...at the same time. Sounds like Bible prophecy to me. Citizens of the Eastern Partnership countries are more satisfied with their lives, but pessimistic about the economy; they also have a more positive image of the EU, and would like it to play a greater role in security and defence. These are some of the key findings of the sixth wave (Autumn 2014) of the EU Neighbourhood Barometer just released. So the supposition found in the previous blog post, that the Antichrist's 7 year treaty will be a security covenant, dovetails nicely with the recent words and actions of EU politicians. The EU increasingly wants to be a "security provider" to the 7-year covenant members and intervene internationally to solve crises. It's not at all strange to suggest that a future, reinforced European Neighborhood Policy based on a 7-year framework, could be the means by which the EU becomes a "security provider" in the neighboring countries. What Ever Happened to Recommendation 666? I recently had a comment conversation with someone many of you readers know, underneath my infographic. However, out of respect for them, I will not disclose their identity (unless they wish I do so). Nevertheless, their discussion prompted me to research additional facts about the High Representative. The WEU Secretary General and CFSP High Representative were the same person. The WEU Secretary General job title was eventually dissolved after the Lisbon Treaty and the CFSP High Representative continued to exist, although it's authority was expanded. The Council and the Commission have powers, each within their own areas of competence and in accordance with the procedures laid down by the Treaties, to take legally binding decisions. However, under Article 38 of the TEU, the Council may authorise the PSC, for the duration of a crisis management operation, to take the relevant decisions concerning the political control and strategic direction of the operation. In the event of a military response, the PSC exercises political control and strategic direction. On the basis of the opinions and recommendations of the EUMC, the PSC evaluates strategic military options, the operation concept and the operation plan to be submitted to the Council. With a view to launching an operation, the PSC sends the Council a recommendation based on the opinions of the EUMC. On that basis the Council decides to launch the operation within the Decision on the action to be taken, determining in particular the role of the High Representative of the Union for Foreign Affairs and Security Policy in the implementation of the measures. During the operation, the High Representative, who may chair the PSC, reports to the Council. On the basis of the proceedings of the PSC, the High Representative directs the activities of the Situation Centre, which supports the PSC and provides it with intelligence on crisis management. So we see here, that the new High Representative position is able to chair the PSC (Political and Security Committee) in the event of an armed attack or crisis management operation. This would presumably constitute an "emergency" described in Recommendation 666 back in 2001. Apparently, the Council is able to determine what authority to delegate to the HR, depending on what route they wish to take. Though indeed, as chair of the PSC, the High Representative would be chairing the body that makes all of the decisions "on the ground." In addition, WEU Recommendation 666 proposes that the High Representative have the power to convene the Council of the European Union in the event of an emergency. This apparently has already taken place as well. All of the Council "configurations" have a rotating chairperson. But the Foreign Affairs Council is the only configuration that has a permanent chairperson. And that person...you guessed it...is the High Representative. The streamlining of the EEAS decision-making structures will be one of my first priorities. This has to be done in parallel with the equally necessary streamlining of Commission and Council decision making processes: the gears of the different "machines" must be brought to a better match and synergy. Here she states that the EEAS decision making structures must be streamlined. She also states that the other two main EU bodies must streamline their decision making as well, so that everything works together better. The EU is increasingly interested and expected to be a security provider in its neighbourhood and beyond. It therefore needs to continue improving its ability to anticipate events and to respond to crises, not only through civilian and military crisis management, but also by employing its broad array of instruments strategically and coherently to enhance overall effectiveness and sustainability. In structural terms, and as highlighted in the EEAS review, there is still work ahead towards improving the integration of the crisis management structures into the EEAS. I intend to streamline the internal delineation of work, to avoid overlaps and enhance civil/military synergies. I will closely look into how to establish an effective link between those structures and the HR, taking into account their specificities. To be honest, I don't think Federica Mogherini has dictatorial ambitious or a passionate lust to take over the world. But I'm somewhat convinced that one of her successors will try this very thing (CLICK HERE, to see the infographic on why I think this). But her wording in her confirmation hearing is very curious to us Bible prophecy watchers, especially since we think her position (the High Representative) is the office of the Antichrist. She talks about the "integration" of the crisis management structures into the EEAS. She talks about how she needs to "streamline" the work and decision making process, making it simpler to "avoid overlaps" and "enhance civil/military synergies." She also wants to make an "effective link" between those structures and the HR itself. All these words sound somewhat ominous, especially if we were worried about power consolidation with respect to military control in the EU. Indeed, even from a purely secular point of view, there seems to be "tail risk" of military dictatorship here, especially since the HR is not an elected official. Though the HR's military powers are quite mild and tame compared to those of a U.S. President, the lack of democracy in choosing this person is a rather exacerbating factor. 40 “At the time of the end the king of the South will engage him in battle, and the king of the North will storm out against him with chariots and cavalry and a great fleet of ships. He will invade many countries and sweep through them like a flood. 41 He will also invade the Beautiful Land. Many countries will fall, but Edom, Moab and the leaders of Ammon will be delivered from his hand. So on the left, all by itself, is the EEAS body, which the High Representative leads. 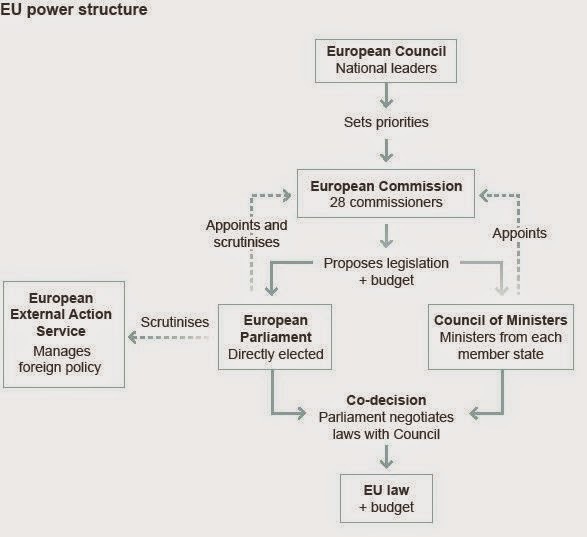 In the middle is the European Commission, which is the law making/proposing body within the EU. Previously, the former HR, Catherine Ashton, had her office in the EEAS building. But now, the new HR has struck a deal with the new President of the European Commission, Jean Claude Juncker, in which her office will be no longer at the EEAS, but in the commission building instead. The reason this arrangement is possible is because the High Representative is also one of the Vice President's of the European Commission. Furthermore, Juncker is redesigning the commission into clusters. Formerly, all 28 commissioners (see chart above) reported directly to the President. Now, these commissioners are organized into groups or "clusters" based on similar jobs, making more layers to the management structure. Not surprisingly, the new High Rep will be in charge of a few commissioners who have portfolios related to external relations. Juncker has even charged the ENP commissioner with making a new Neighborhood Policy by the end of the year. According to some, Juncker is the "foreign policy president." So now, Mogherini, the high rep, has more power over the external relations commissioners. But she has "less," in that she will have a harder time dispelling the notion that she actually reports to Juncker. The High Representative position, which has been enlarged by the treaty of Lisbon, continues to move in a direction where it is the center of all the action. With this recent deal between Mogherini and Juncker, it is hard to say who has the upper hand. But it increasingly consolidates the role of the High Representative, paving the way for the future Antichrist. In the previous blogpost, I demonstrated that there is decent support for the idea that the Antichrist's 7 year covenant might be an arrangement designed to guarantee Israel's security, though this cannot be said with certainty. Furthermore, I explored the possible meaning of what it means for him to "confirm" a covenant for 7 years, and the Hebrew word behind that. Indeed, there is support for the idea that the word can mean the confirmation or enforcement of an existing covenant, and not necessarily the creation of a brand new one. All of this is very interesting, especially considering the EU already has a recurring 7 year treaty with Israel. The European Neighborhood Policy is considered weak and ineffective, thus prompting the need for a comprehensive review by the end of 2015. It is easy to see how the future Antichrist could confirm or cause to prevail the existing European Neighborhood Policy (which is based on a seven year framework) in order to make it more effective. Furthermore, based on the statements made by the new High Representative, the EU is increasingly interested in acting as a "security provider" in the neighborhood. It is not at all a stretch to see how a future reinforced ENP could be a security covenant for its neighbors, organized around a 7-year framework. Furthermore, we have seen the suggestions of WEU Recommendation 666 back in 2001 come full circle in the High Representative position under the Treaty of Lisbon. Almost all of the recommendations put forth in that document have been implemented in the new High Representative position. The powers the new HR has in the event of a military attack on the EU are rather ominous and concerning. This is exacerbated by the fact that the new HR talks as if she wants to "streamline" decision making structures and connect the crisis management powers to the High Representative itself. The fact that an unelected official either has or wants to acrue these powers to themselves is concerning indeed. According to New Testament scholar and Christian apologist Michael Licona, one characteristic of a good theory is "illumination." Meaning the theory helps us understand everything else. I believe, even 5 years after its apparent failure, that ENP theory is alive and well and continues to make sense of the last 20 years of European history. Furthermore, it continues to shed light on the world we live in today, continuing to have a powerful relevance. All other citations are linked internally above. Excellent research! I must say that there is truly a blessing from God for you in the time and effort that you have sacrificed to bring this most valuable information to the Body of Christ. Your most excellent research is bringing forth what Scripture has clearly mentioned and warned us of in that you are painting a picture that potentially sets the stage for the entrance of the coming Antichrist. Now I must humbly ask....Revelation 13:5 sets the stage in which the coming Antichrist is either given "power to act" or "power to continue" for 42 months. Based on your studies, and research...could this be someone who has previously held this position before - or could it be another? I ask this because based on what is written in Revelation 13:5 - and it truly depends on which translation one reads...it appears to call for "understanding" or "interpretation". This same understanding and/or interpretation could actually apply to what you have presented in your topic. The other question I have is also related to Revelation 13. Do you believe that it is speaking of a Kingdom or Empire and a Man - or 2 men who will work together in a final Empire? I ask this as well, as it could bring great value as far as interpretation to what you have presented so far. Thanks for your kind words. Thank you also for your faithful perseverance in this idea, which I also believe along with you, represents the truth of the times we live in. Sorry it has taken me so long to reply to you.. I have recently launched a project which has delayed my reply. Theologically speaking, I don’t see any reason why the final beast ruler couldn’t have been a previous office holder of the High Representative position who has made a return. I guess I see no reason against that idea, Biblically speaking.Nevertheless, I would venture to say the Bible is silent on that. It could be either one, a previous officer holder or a new person. It seems the beast is given authority to act for 42 months (see interlinear above). But it is clear the final ruler is actively involved in politics prior to this 42 month reign of terror (Daniel 7; Daniel 11:36-45). Nevertheless, he probably just doesn’t have as much power or ability to persecute before then. So I guess, from a scriptural standpoint, I guess it could go either way. I believe that we must prayerfully view, and consider what Paul has written in Scripture as it relates to the End Time. In Paul's writings, he clearly indicates a certain level of "imminence" upon our Watching for our Lord's Return. However, He also clearly states that "concerning the Lord's Return AND our gathering unto Him" that , that DAY will not come unless the "falling away" or the "apostasy" occurs AND the "man of sin is revealed". (2 Thessalonians 2:1-8) So that may sound contradictory, but I believe that he was awaiting the "man of sin" to be revealed in his time. I've mentioned Revelation 13 because in my very humble opinion it only mentions an End Time System - and a Man. I believe that this is clearly in contrast to the "man of sin" AND a so-called "False Prophet" theory. I think this is key to understanding, in that it could very well relate to what you have presented as the EU High Representative's Office "may" have created a platform for the coming "man of sin" to arise to power. It is the Beast Empire that has created this Position. He will come in working behind the power of Satan that this Beast Empire has clearly established before he actually comes to power....and I believe that it is currently in the works. I would like you, and others who may be reading this to ponder on what I have presented. Please tell me if you agree, or disagree - and believe me that disagreeing is not bad. It's all about edifying the Body of Christ, and certainly bringing Glory to His Name! This posting by Britt Gillette is really relevant to this particular topic of discussion as he seems to imply that he believes that it is only ONE End Time player, and the System that sets up the platform to put him into motion. JS is emerging in the news this very week. He remains the best candidate until he is dead. I have posted several times recently and my comments are not making it to your site. What is the procedure ? In a very strange about-face on my part, I am for the first time inclined to agree with you. I was actually working on a large post about Javier Solana this afternoon. This is a quote from the CEPS twitter page. Quite dramatic. Astounding actually. Very sorry to hear about the comments troubles. Do you mean that they aren't submitting onto the website? Or that I am not seeing them? My apologies I often have delayed responses to the comments and for some reason Gmail doesn't email my inbox when there is a new comment, it goes into the other tab. Great to hear from you anonymous. Also, I have created a forum in the top tabs, but as of yet no one has posted in it. Commenting on the blogposts still works great as well. I just need to set up my inbox so that I see the new comments when they come in, and reply promptly. However, if its a technical issue, I will look into that as well.